The electric blanket can be a useful, convenient tool for consumers. However, the use of an electric blanket can also increase the risk of a house or property fire, and of personal injury. Due to the nature of the product, electrical fires, smoldering, and full flame combustion are possible, and the chances of these incidents occurring increases greatly when the product becomes worn or damaged. Manufacturing mistakes; i.e., improperly installed wiring, faulty control unit. This cause is rather uncommon, and the least often occurring cause in cases of electric blanket fires. Improper handling of the electric blanket unit, such as prolonged use or unsupervised use in situations concerning small children or elderly persons with physical handicaps. Normal wear and tear, which can cause the wire implements or other components to fray, break, or become otherwise damaged and susceptible to malfunction. It is believed that 99% of all fires and other accidents related to electric blankets and heating pads are caused by units which are 10 or more years old. Regular safety checks and efforts to discard and replace old blankets can help to prevent fires and injuries from occurring. Electric blanket malfunctions can cause personal injury or damage to property. 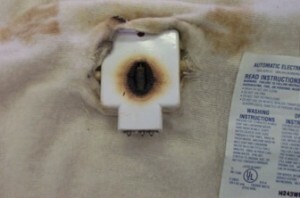 Smoldering, sparking, scorch marks, and missing components can all be signs of an unsafe electric blanket. If you notice or suspect any of these characteristics to be occurring in your own electric blanket, discontinue use and discard the blanket immediately. When a fire destroys property and causes injury because of a manufacturer defect or a failure of the manufacturer to provide clear warnings about the product’s use, the victim is entitled to restitution. A personal injury lawyer can handle your case and negotiate to win you a settlement that is fair and sufficient to cover your costs of recovery. Fatalities due to electric blanket fires are rare, but do occur. Along with normal precautions and safety assessments, consumers should be certain to never leave a child, an elderly individual, or any individual having or experiencing sensory limitations with an electric blanket for extended, unsupervised periods of time, or to leave an electric blanket plugged in and powered on overnight. If you or someone you know has experienced property damage, injury due to electric blanket fire, smoldering, or electrocution, or if someone you know has died due to electric blanket malfunction, please do not hesitate to contact the Warshauer-McLaughlin Law Group, P.C., at (720) 420-9800.